Wristbands are one of those accessories which seem to experience constant resurgences in popularity. With this in mind, we took the time to create some great personalised wristband usb sticks. These wristbands are firm favourites with many working in digital sectors, such as developers, marketers, on the go computer engineers. Anyone who needs to be mobile while working on various pieces of work can save a lot of time, effort and potential lost data by carrying one or two of these handy bracelets. A great way to promote your business at conferences and expo’s as well as extending important updates throughout your company. Our wristband USB sticks feature a comfortable and eye catching bracelet design, which can be fully customised to suit your needs. The Rubber is soft and flexible, water resistant and forms the housing of the USB Device. When closed the USB cannot be seen and merely resembles a popular rubber bracelet. These bracelets offer a stylish, easy to remember and slightly water resistant solution to carrying your data with you as you travel. 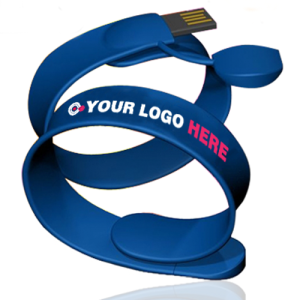 Our wristband USB’s provide a great way to market to students and young people, or simply ensure that your employees and students have no excuse for forgetting their essential documents.